Since The Wharf opened in 1984, visiting Sydney Theatre Company has been a unique Sydney experience. Over that time, the Company has grown, times have changed, and facilities at The Wharf are bearing 30 years of wear and tear. Our needs and the needs of our audiences have evolved. For the past couple of years, we have been planning a Wharf Renewal Project, with the aim of making much-needed improvements to the audience facilities and theatre-making spaces here on The Wharf. $60 million is required to fund our Wharf Renewal Project. In April 2017, it was announced that the NSW Government has committed $30 million towards the project. The additional funds required to complete the project will be raised by Sydney Theatre Company. We will match this government funding dollar for dollar. The majority of this philanthropic funding is already in place. This modernisation of our facilities will be the first significant upgrade for the Company in 30 years. We have planned this project in close consultation with artists, theatre-makers and specialist consultants including heritage architects, and all the refurbishment works have been designed with a heritage framework. Our Wharf Renewal Project will maintain the beloved character of the building and enhance the heritage features, while also providing better accessibility, modernised theatres and a more comfortable theatre experience for you, our audience. This page outlines our plans and what we hope to achieve, and will be updated regularly. The heritage significance of The Wharf and the Sulman Award-winning architectural design by Vivian Fraser have, along with the spectacular Walsh Bay location, been key contributors to the Wharf’s success. The architects were NSW Government Architect, JW Thomson in association with Vivian Fraser, Architect; (Government Architects Branch) Principal Architect Special Projects Section, Andrew Andersons; Project Architect, David Churches; Supervising Architect, Michael Fletcher; (Vivian Fraser, Architect) Partner-in-Charge, Vivian Fraser; Associate-in-Charge, Barry McGregor. From the outset, The Wharf has brought together every facet of theatre-making under one roof in a unique way. Raw materials enter at one end, moving through workshops, scenic art, costume and rehearsal spaces before reaching the theatre at the other end. The Wharf Renewal Project maintains The Wharf’s distinctive character, it continues to house the full theatre-making process under one roof. 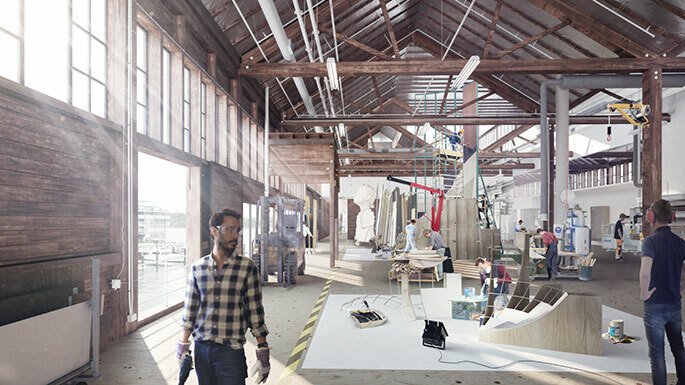 It creates new and better experience for artists and audiences, and it will ensure that the Wharf remains an inspiration for adaptive reuse of a heritage building. It builds on a vibrant legacy and will serve the city of Sydney for decades to come. Sydney Theatre Company was founded in December 1978, and took up its home at the Wharf in 1984, over 30 years ago. In that time, the Wharf has become an essential and beloved part of STC’s identity for artists, staff and audiences. When STC moved into the Wharf in 1984, it presented 6 plays a year across 2 venues. Today, STC presents about 16 productions across 4 venues, plus regional and international tours, and runs a host of other programs and initiatives. All of this still happens on the Wharf, in the same workshop, production and rehearsal facilities as existed 30 years ago. The STC workshop, where set and props are constructed, was the first part of the company to be housed at the Wharf – the team squatted in the empty shell of the building as early as 1980. From such humble, improvised beginnings, the sets built there have travelled to some of the most celebrated theatres around the globe. More than three decades on, technical and safety requirements have changed greatly. The growth in STC’s artistic output has also led to an increase in staff who are housed on The Wharf. In addition, we recognise the need to improve accessibility and upgrade audience amenities at The Wharf to ensure our many visitors have the best possible experience now and in the future. Amongst other improvements, STC’s Wharf Renewal Project delivers modernised Wharf 1 and Wharf 2 Theatres with flexible seating configurations, just as Richard Wherrett had envisaged. These spaces will be responsive to distinctive theatrical visions, offering artists more scope of expression and providing audiences with a greater range of theatre experiences and a higher level of amenity. The wonderful walk to the theatre along the full length of the building will be preserved. Rehearsal spaces will also be improved with sound-proofing and full-size spaces, while artist dressing rooms on the Wharf will also be modernised. More flexible theatre spaces will allow STC’s work to more easily transfer to other venues, and to reach broader audiences. We anticipate the Wharf Renewal Project will afford STC an increased ability to tour work internationally, nationally and regionally. STC’s Wharf Renewal Project opens up the Wharf to the public in new and improved ways, whilst staying true to the building’s important heritage and much-loved character. At Hickson Road, a more welcoming entry point will guide visitors onto the Wharf and provide clearer accessibility. Two new accessible public entries, one midway along the Wharf and one at the bar, offer opportunities for visitors to engage with and enter the building from the harbourside promenade. Both these entries will have lifts. Improved facilities include new foyer spaces, rest rooms and more efficient paths of travel. The theatre-watching experience for audience members will also be improved. The inside of the theatres will be upgraded for better comfort and accessibility. These enhancements ensure that STC can offer a great visitor experience for everyone in Sydney. Over the past 30 years, as STC has continued to grow its artistic output, the demands on its facilities behind the scenes have grown too. STC’s Wharf Renewal Project will create spaces that match the work done across all areas of the company. As part of the project, the ceiling height in the workshop will be raised to allow larger sets to be built. Transport of heavy goods within the building will be improved with a more efficient layout and new equipment. Health and safety will also be improved through better ventilation. The administrative offices of STC will be updated to reflect changes in current business practice. STC’s Wharf Renewal Project has been led by consultations with a cohort of theatre-makers and designers who work regularly with STC. Their knowledge and love of the building and their experience as artists have been instrumental forces in shaping a vision for the future of the Wharf. This artistic input, together with the input of STC staff and audiences, has been teamed with the expertise of specialist consultants, including HASSELL (architect), Charcoalblue (theatre consultant), Tropman & Tropman Architects (heritage architect), ARUP (building services, fire engineering, sustainable design), Taylor Thomson Whitting (engineer) and MBM (quantity surveyor). As the project has taken shape, consultation has also occurred with key external stakeholders and the broader Walsh Bay community. Arts NSW and Infrastructure NSW have been closely involved, as have the architects of the Pier 2/3 redevelopment, to ensure that work on the whole Walsh Bay Arts Precinct is complementary and synchronised to minimise disruption. Neighbouring arts organisations, businesses and the local community have also been consulted and will have the opportunity to attend a public exhibition of the proposed development. Sydney Theatre Company has moved off The Wharf. Wharf 1 and 2 Theatres are now closed. STC will be back at The Wharf in 2020 — we look forward to welcoming you back. Our 2019 Season will be presented at four venues: Roslyn Packer Theatre, Sydney Opera House (Drama Theatre and The Studio), and Riverside Parramatta. Explore the Season. The Wharf will be closed for renovation throughout 2019. The STC Wharf Box Office has relocated to Roslyn Packer Theatre at 22 Hickson Road Walsh Bay. The Roslyn Packer Theatre is just a 2 to 3 minute stroll down from The Wharf, across the road, opposite Pier 6/7. $60 million is required to fund the Wharf Renewal Project. In April 2017, it was announced that the NSW Government has committed $30 million towards the project. Sydney Theatre Company will raise the additional funds required to complete the project, matching this government funding dollar for dollar. The majority of this philanthropic funding is already in place. Artist's impression of external view of The Wharf at Pier 4/5. Artist's impression of bar and multi-purpose spaces at the end of The Wharf. 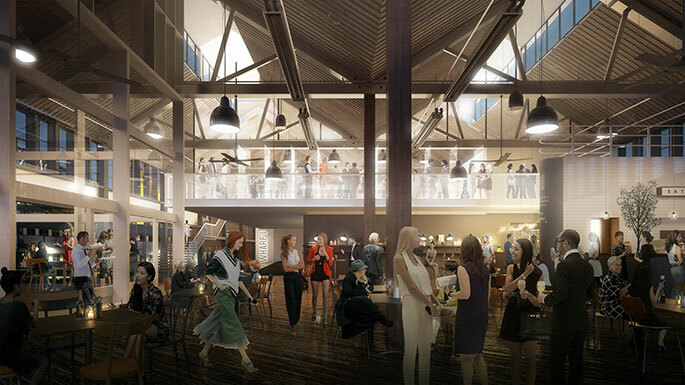 Artist's impression of workshop spaces inside The Wharf. What is involved in Sydney Theatre Company’s Wharf Renewal Project? An upgrade of Sydney Theatre Company’s existing facility at Pier 4/5. This proposal includes modernised theatres and audience facilities, more flexible theatres, rehearsal and workshop spaces. Improved facilities will ensure that STC can offer an even better visitor experience. When completed, how will The Wharf it be different for audiences? We’ll be able to provide an improved visitor experience across The Wharf, while retaining the beautiful heritage features of the building. The Wharf Renewal Project will upgrade foyer spaces, toilets, accessibility, seating in the theatres, and there will be two new entry points. The NSW government has committed to funding of $30 million towards the project. This is being matched dollar for dollar by Sydney Theatre Company, who will raise the remaining $30 million. We have reached our initial fundraising target for the base build project construction. We are now looking at additional fundraising to invest in artistic, programming and audience opportunities both during our off-site phase, when building works are underway, and in preparation for the grand relaunch of STC back into its home base at The Wharf. Is this project part of the overall work on the Walsh Bay Arts Precinct? It is intended that STC’s Wharf Renewal Project will be coordinated with the broader work on the Walsh Bay Arts Precinct. See below for more info about the Walsh Bay Arts Precinct. Have artists been involved in the consultation process? Yes. We have been consulting with a range of artists, including directors, set, lighting and sound designers, about our plans for the Wharf Renewal Project and what the renovation will mean for the theatre-making process. Will parking and access be affected? Will Walsh Bay restaurants and bars still operate during construction? If there are disruptions to access, parking and public transport, or changed opening times for restaurants and bars, we will keep audiences updated on our website and in our pre-show emails that are sent to ticket-holders. How do I find out what’s happening in Walsh Bay before I come to the theatre? The most convenient way to get up-to-date information sent to you before you visit is to ensure you are receiving our pre-show emails. If you do not receive pre-show emails, please sign up on our website or contact our Box Office on (02) 9250 1777 to opt in. The pre-show emails contain important and useful information to ensure you have the best possible STC experience. Is Roslyn Packer Theatre affected? No. Roslyn Packer Theatre will remain open and operational throughout The Wharf Renewal Project. Will STC’s Greening the Wharf initiatives still be in place after the renovation? Yes, our greening initiatives including our solar panels and rainwater harvesting facilities will be maintained. Some changes may be made with the positioning of some of the solar panels. 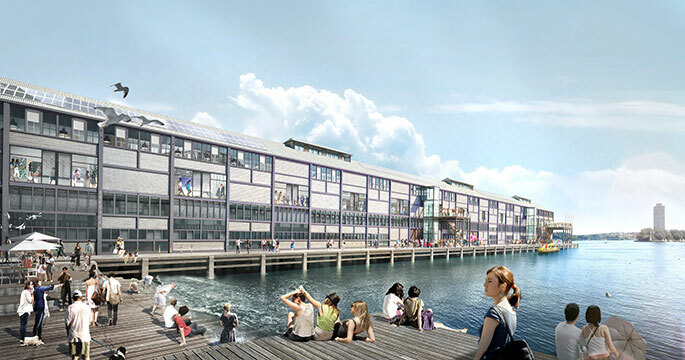 STC’s Wharf Renewal Project is part of the broader redevelopment of the Walsh Bay Arts Precinct. Due for completion in 2020, the development will boost an already dynamic creative hub with new opportunities for rich and diverse cultural works and events for public enjoyment, whilst celebrating the unique heritage of the precinct. On completion, the revitalised Walsh Bay Arts precinct will be home to an expanded group of prestigious arts companies including Sydney Dance Company, Bangarra Dance Theatre, Philharmonia Choirs, Gondwana Choirs, the Song Company, Bell Shakespeare, Australian Chamber Orchestra and Australian Theatre for Young People. The NSW government is responsible for managing the construction process and have signed a contract with Richard Crookes Constructions to deliver Stage One of the redevelopment of the Walsh Bay Arts Precinct. The NSW based firm has a track record in delivering a range of NSW Government projects across the health, education and justice sectors. The project is being delivered in two stages. Stage One work includes demolition and strip out of existing internal facilities inside Wharf 4/5. Stage Two includes detailed fit out work to both Pier 2/3 and Wharf 4/5.